Our Pledge to you is Quality and Service! An Article about us in the Southern Jewelry News. 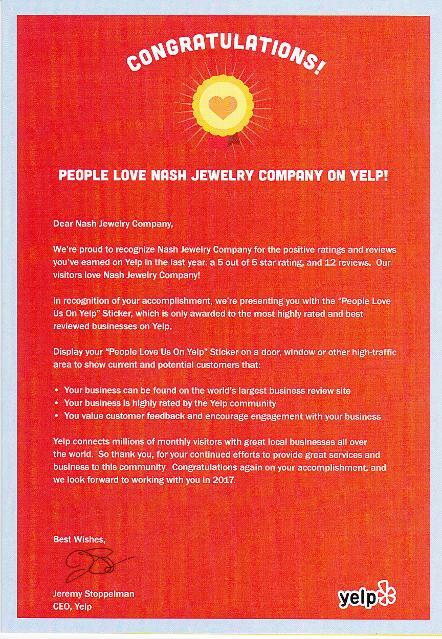 Nash Jewelry can provide detailed appraisals of diamonds and fine jewelry. All appraisals are expertly handled by our G.I.A.Gemologist. Our services include appraising diamonds and fine jewelry in the settlement of estates, claims and divorce proceedings, as well as testifying in court as a jewelry expert on behalf of clients. Our appraisals which are scheduled by appointment are conducted in the strictest of confidence. Photographs are provided with our appraisals. We guarantee that you will not be disappointed by either the quality or the cost of our professional service. Please call us to set an appointment. 561-655-1658 or email me direct at gregonash54@gmail.com.